The Chancel Choir is open to any adult who enjoys sharing his/her musical talent during worship. 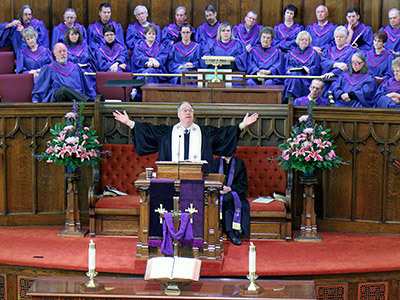 The Chancel Choir participates regularly at the 10:45 a.m. worship service in the Sanctuary. They rehearse Wednesday evenings at 7:00 pm and Sunday morning at 10:00 am. Rehearsals are open to anyone with a joy of singing; no experience is necessary. The Chancel Choir includes six staff soloists/section leaders, our Organist (Mark Sweeney) and our Director of Music (Steve Bixler).